Greetings, Resistance Rising followers! It has been a long while (far too long) since my last update. I spent the holiday season and the months afterwards working with a new editor, polishing the draft to its final stage and, now, reevaluating how to move forward in the best interests of this novel. In not meeting the Quill goal, Inkshares turned out not to be the right platform for me, so I am pursuing other options to publish the book. In fact, I will be moving forward this week! 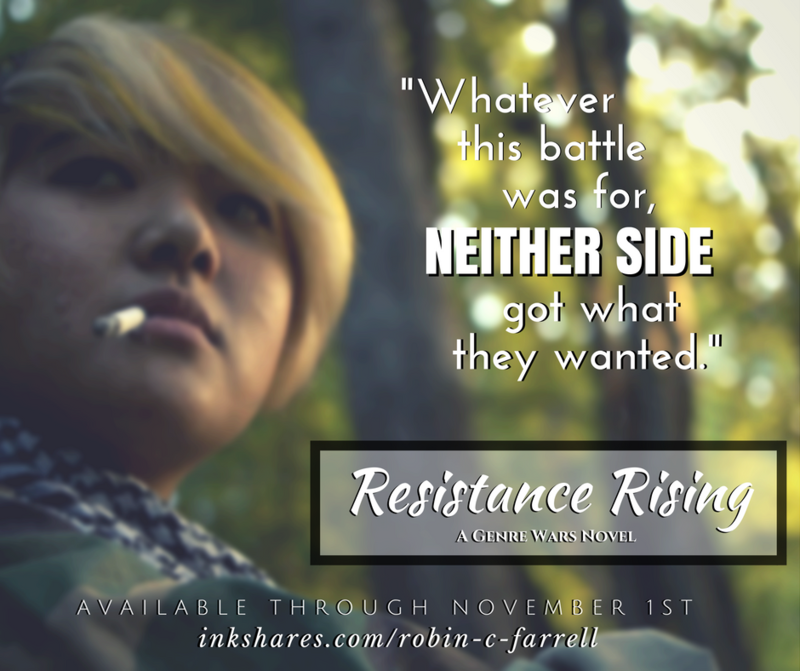 I will also be taking Resistance Rising off of Inkshares within the next couple of days, but don’t be alarmed! Simply visit the link above and learn how you can contribute to my upcoming fundraising efforts. Thank you for the support and interest you have shown along the way. The journey is not yet over, though, so I hope to see you as the next phase begins. 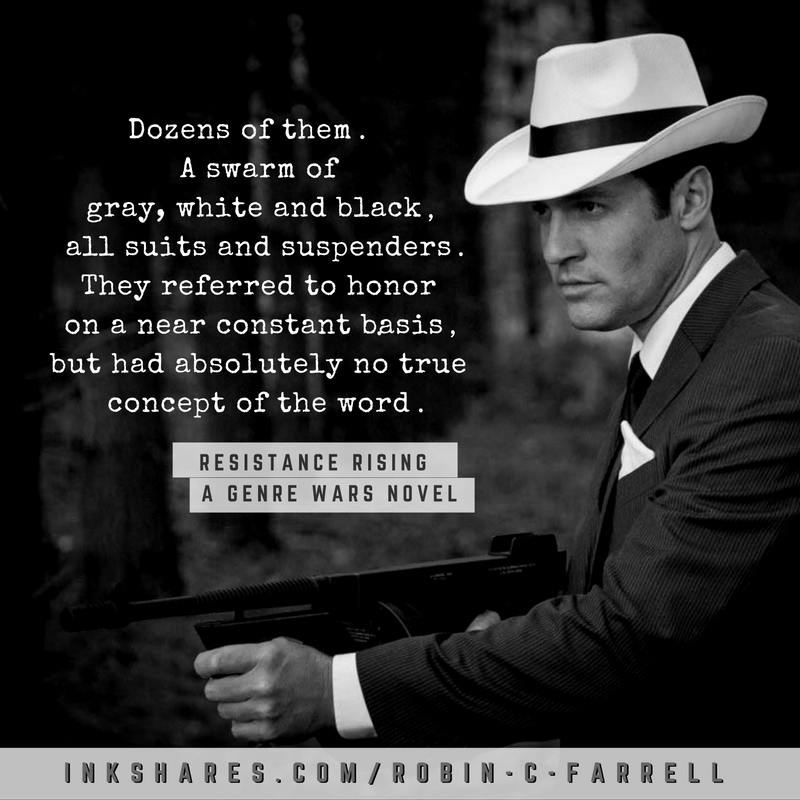 That’s right: Mobsters appear in this novel and they are a force to be reckoned with. 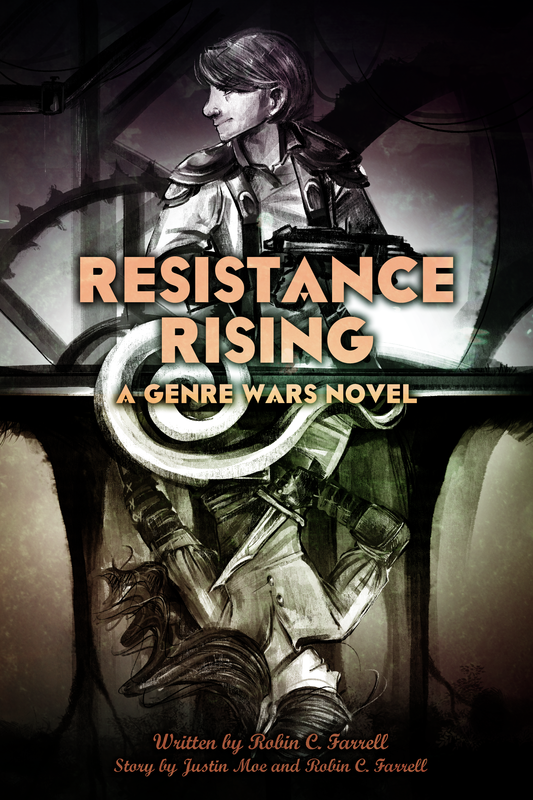 For those new followers of the novel, Resistance Rising began as a filmmaking competition, Genre Wars, back in 2012, and has been an ongoing adventure ever since. Watch the unique journey here. It was always a goal of mine to bring the gangsters of film noir into this story, all the way back at the start of the contest. It’s a genre that doesn’t get showcased very often; especially not next to high fantasy. The photo above was taken by DL Moody. 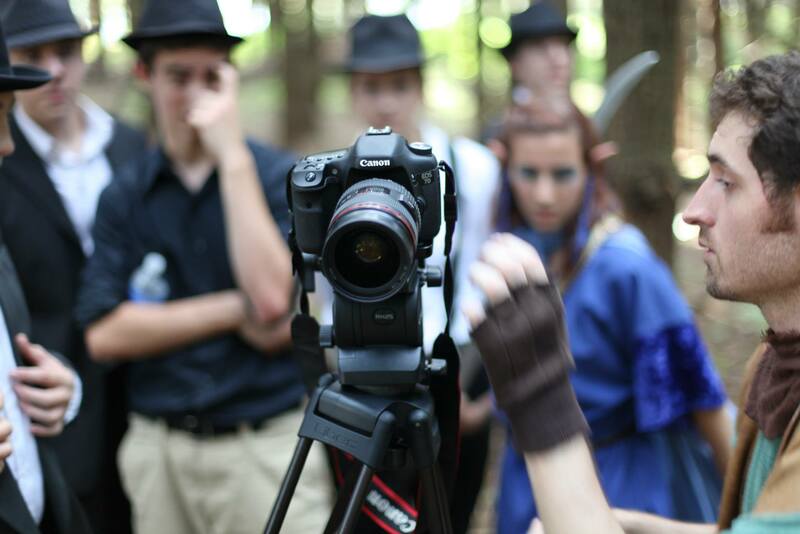 There are more photographs from this production day as well as the rest of our spectacle-filled production on the Genre Wars Facebook Page. 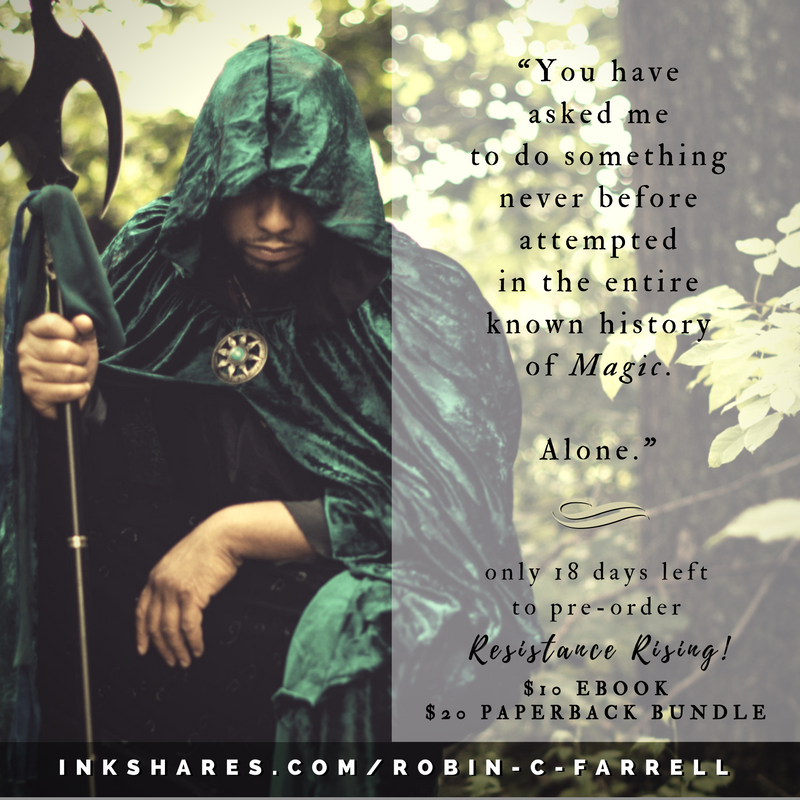 In other news: only ten days remain to pre-order a copy of Resistance Rising! If you are a new follower (or have been following for a while now) but have not yet pre-ordered, I hope you will please do grab a copy before it’s too late! I am SO excited to officially share the new, custom-designed cover for Resistance Rising with you all! The artwork is by the amazingly talented Annamarie C. Mickey. Discover more of her work in her deviantART gallery and you can find her on Twitter as @ac_mickey. In other great news, Resistance Rising has officially crossed the three-digit mark in it’s pre-orders! 100 strong and still going! Special thanks to Kassandra Marie Kimball, Tahani Nelson (author of The Last Faoii), AC Baldwin (author of The Traveller’s Cup) and Ferd Crôtte (author of Mission 51)! It’s a long shot to make it to Quill by 11/1, but I think we can do it! If you’ve already pre-ordered, please consider leaving a review, making a recommendation or, if you’re in the DC/MD/VA area, stop by Coffee, Tea and Reading at Dublin Roasters in Frederick, MD on Saturday morning! Great breakfast beverages and great local authors reading excerpts from their work. And if you haven’t pre-ordered, please consider grabbing a copy and help see this thing across the finish line. Just a quick update to let you know that a new cover is coming! The brilliant Annamarie C. Mickey has been working for the past couple of weeks designing a custom cover for Resistance Rising and I’m super excited to share it with you! Check out Annamarie’s work on her website, on DeviantArt, and on Twitter @ac_mickey. A page devoted to the novel has been added to the Genre Wars series web site. Check out the page if you haven’t already! As ever, I am so grateful to all of you who are supporting this project and helping me see this thing through! If you haven’t pre-ordered, please consider doing so today. If you have already, convince a friend, or leave a review. Happy Friday! I write you with only twenty-two days days left to pre-order Resistance Rising! But we still need a whopping 158 BOOKS TO QUILL! And YOU can still help make that happen. How? Recommend Resistance Rising here on Inkshares, and give some more shout outs on social media. 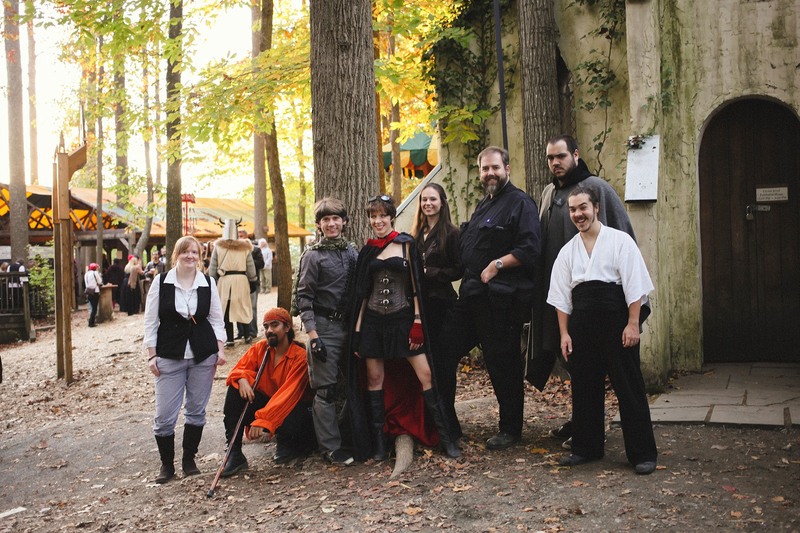 Or send a personal message to someone you think might dig a super cool fantasy novel. Tell them it’s a unique blend of sci-fi and fantasy, with appearances from all sorts of other genres (steampunk, noir, mobsters, cowboys, vampires and ninjas...just to name a few). And that it’s the companion to indie web series in post production. And, of course, to anyone out there on Inkshares that is still on the fence, just watching and waiting, please take the leap and grab a copy. 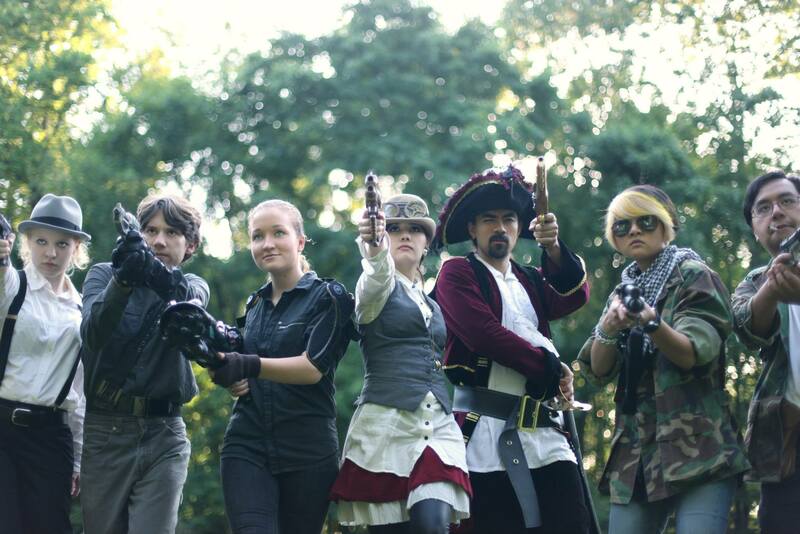 Join the Resistance and be part of the adventure! 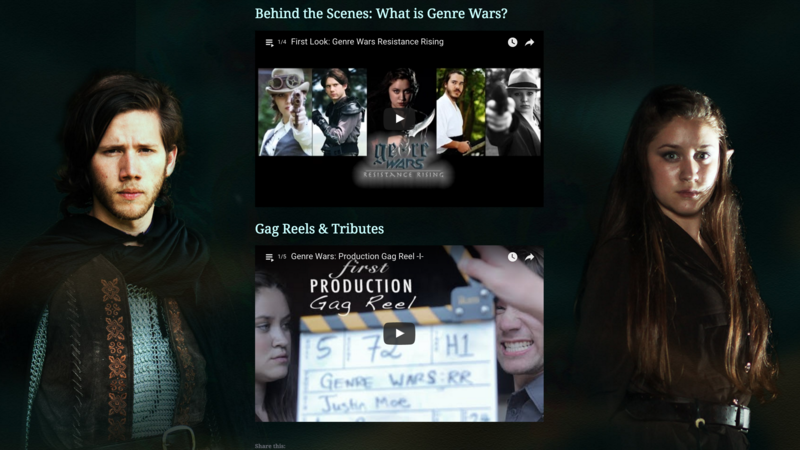 For a more expansive look into the world of Kabathan and the story behind the story, visit the web series site at www.genrewars.tv and check out some of the BTS from the production, who we are as storytellers and what makes this whole thing such a unique project and personal endeavor. And make sure to find Genre Wars on Facebook. and Instagram. "We have the chance to make a change. To start a real revolution. Salutations, friends! Happy Monday to all, and to new followers, welcome to the Resistance! Onto to the updates: this weekend I attended The Small Press Expo for the first time and had a blast, and discovered #Inktober. I’ve never been much of a painter or drawer, but I’m gonna give this produce-one-ink-piece-per-October-day a shot with quotes from Resistance Rising. If you aren’t already, find me here, on Instagram, as I take up a new challenge, and to see more insights and character quotes, beats and moments from throughout Resistance Rising. In the present scheme of things, I will be posting more chapters this week! Also, if you enjoyed the audiobook-style recording of the prologue (take a listen here), then rejoice, for more is coming, thanks, again, to Audible narrator, Benjamin Cairns. Chapter One will be available this week...maybe more! Looking further ahead, I will be on the move in the upcoming days and for those of you in the DC/Maryland/Virginia area, I would love to see you! This coming weekend happens to be jam-packed with events for the book community in this area! Starting on Friday, September 23rd, I’ll be at Jirani Coffeehouse, located in Manassas, VA, for part of their monthly event, Spilled Ink, at which I - along with other writers and creatives - will be reading our work publicly. In my case, it will be a segment from Resistance Rising to continue to spread the word. If you’re in the area, come out, say hello, and have a listen! Then, there’s The Baltimore Book Festival, The National Book Festival, and Fall For the Book, all of which have rockin guests and panels lined up this year. I will be attempting to attend as many of those as I can. Hopefully, so will some of you! Thank you again for your support and interest. If you’re still on the fence about this book, I’ll be following this update with a bit more history about the project, which I hope will convince to make that pre-order! 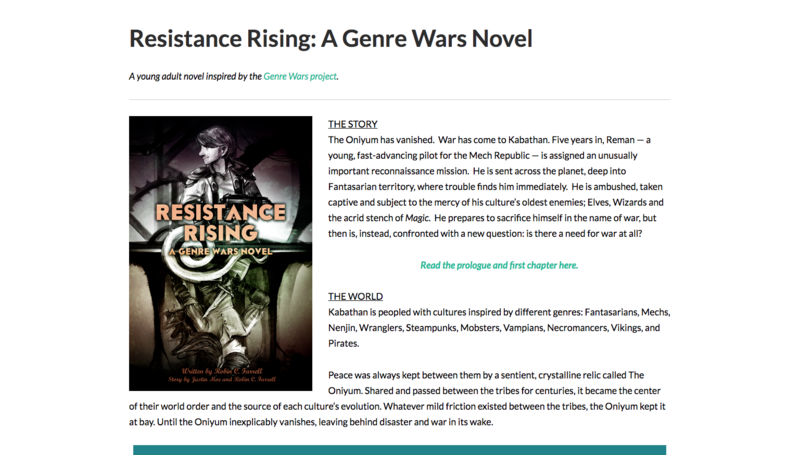 If you’ve already pre-ordered, you can still help by leaving a review and/or recommending Resistance Rising right here on Inkshares. Greetings, all! Behold: Resistance Rising update the first! I want to extend my thanks to all of you, whether you have already done me the honor of purchasing a pre-order or are considering doing so. More chapters will be posted soon, but, in the meantime, I wanted to share with you a special update. I recently sat down with book reviewer & blogger Barbara Brutt to shed some further insight on the novel: what it’s all really about (plot, characters, themes) and what makes it special, why I’ve chosen to crowdfund through Inkshares and the evolution of the Genre Wars story from online filmmaking contest to indie web series and, now, to novel. Embodiments of genres all living in one space as co-existing cultures ignited my imagination. Yet, that concept wasn’t the narrative. The story is how the characters deal with losing their world structure and facing reawakened cultural tensions. You’ll also find, included in the article, a link to an audiobook sample of the Prologue, narrated by Benjamin Cairns. Thank you again for your support and interest. If you’re still on the fence about this book, then I hope that this interview will help convince to make that pre-order! If you’ve already pre-ordered, you can still help by leaving a review. ***Note: photos taken by Jenna Miller of Jenna M. Miller Photography.